Wasim is an Instructor in Anesthesia at Harvard Medical School and is also affiliated with the Division of Engineering, Brown University. He received his Ph.D. in electrical engineering at Oxford University, followed by postdoctoral work at Oxford with Prof. David Edwards, where he developed ultrawideband wireless communications technology. He then conducted postdoctoral research at MIT and Harvard with Prof. Emery Brown, where he developed statistical signal processing techniques for neuroscience applications. 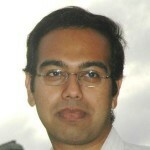 Wasim joined the BrainGate team in January 2009, where he investigated optimal information extraction approaches and decoding algorithms for neural prosthetics. He is a Senior Member of the IEEE and a Member of SfN. A list of his publications can be accessed at www.mit.edu/~wqm.